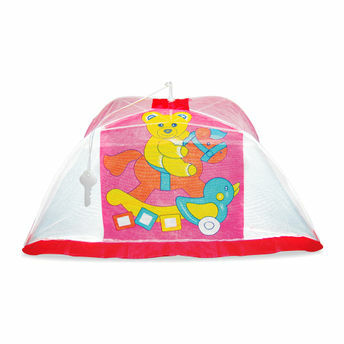 A must-have bedtime accessory for babies, Little's mosquito net ensure maximum protection from flies, mosquitoes and insects.This easy to use mosquito net can be folded flat like an umbrella when not in use and carried while travelling easily.Made from high quality mesh fabric, this mosquito net provides utmost safety and completely covers the baby's bed like an umbrella.Little's Mosquito Net provides excellent air circulation and avoids any discomfort to babies and comes along with a special locking key to prevent the net from falling on the baby. Maximum protection from mosquitoes and insects. Easily foldable and light weight to carry while travelling. Thick mesh for complete protection along with excellent air circulation. A special locking key on the top to protect the net from falling down on the baby. Can be used for newborns and babies upto 1 year of age. Size - 24 x 36 inches.